Instagram has millions of monthly viewers who share and view photos. Instagram is the best platform for businesses to tell a story in an instant to their customers. Instagram Videos proved that the content posted on Instagram gets a good response and as many as 75 people per 100 take actions such as going to the official website or shopping after watching the business post on Instagram. To promote business on Instagram, first, a profile has to be created. Download the app on smartphone, tablet or desktop. Sign up with the email address or phone number. Choose the best username relevant to your business. It is also possible to create the account through Facebook. For business usage, connect the Instagram profile with the Facebook business page. Provide details such as phone number, email, and address for the business. If the details were already given on your Facebook business page, the information would be auto-filled. Click done. If the Facebook business page not created, it could be built now. Invite contacts to follow your Instagram page. 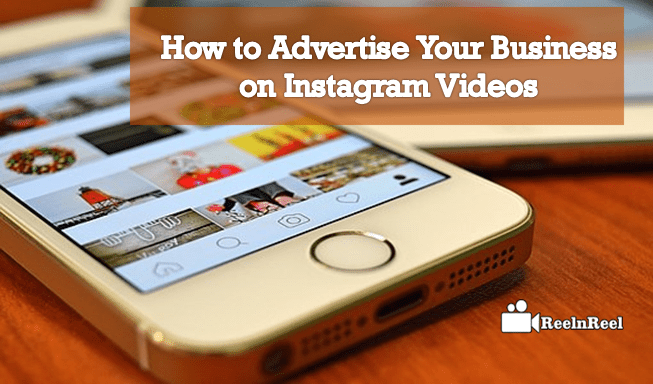 It is not difficult to create video ads for Instagram. Most of the audience on Instagram watch the content on their mobiles. Therefore make sure that the message reaches the audience even when the sound is off. Use text or captions to deliver the message. Use square videos which are the big hit. Let the videos be less than thirty seconds long. There are standard and video carousel ads. Standard video ads allow including a call to action and video carousel ads enable adding up to five videos to a single ad and the users can view one by one. A call to action also can be included. Here are some tips to advertise the business on Instagram and to consider while creating video marketing campaigns for the app. Have a goal for the video ad. Be clear with the message you are delivering. Define the goals of the campaign. Is it for increasing website traffic, conversion or building brand awareness? Let the videos be short and sweet and have a punchy approach to the message you are delivering. Grab the attention of the viewers in the very first few seconds of the video. Ensure that the content is eye-catching and also meaningful. Paid video ads on Instagram include a call to action. These include Shop now, book now, signup, download, contact us, etc. Include a compelling call to action. Be consistent in messaging, branding and visuals. Engage with the audience with funny comments. Instagram video advertising is suitable for all types of business. With Instagram advertising precise targeting is possible. Higher reach on the content can achieved. Paid advertising is helpful for the brands to showcase more products. Using collection ads businesses can combine photos and videos to promote their products and users need not leave the platform to make purchases. Though Instagram advertising is a perfect fit for most businesses, there are some cons. Active users of Instagram are in the age group of 18-29 years. Instagram might not be the right place to reach older audiences. Time management and update of Instagram ads are time-consuming. Since Instagram is a visual platform, frequent updates for keeping the message fresh is required. While considering Instagram for advertising, make sure to keep in mind the pros and cons. Any social media platform is capable of creating or destroying brand loyalty. It is for the brands to find the customers and promote the product or service to them. Instagram is one method of delivery that helps in connecting the brand to potential customers. Studies revealed that internet users under 25 years of age spend more than half an hour in a day on Instagram. Over 25 spend more than twenty minutes a day. This shows that Instagram offers a significant marketing opportunity for businesses. More than 25% of advertisements on Instagram are now videos. The platform has great potential to attract new customers. Instagram offers the best opportunity for word-of-mouth marketing. The businesses not only have access to potential customers, they also allow the audience to share the brand with their network. Having active followers and engaging them with the video content helps foster credibility and generate brand awareness. Instagram is the ideal platform for increased visibility and to increase brand awareness. Instagram allows uploading photos as well as videos. Studies revealed that 25%of advertisements on Instagram are videos. Instagram video ads must hook the audience in the first 30 seconds. Though the videos can be of 60 seconds long, the length of the video can affect the engagement. Instagram ads increased by 28% in the later part of 2017. 35% of the total Instagram users create or view videos via stories. Many businesses are using Instagram videos to connect with their followers. Millions of people are watching Instagram videos created by brands. Audience irrespective of age, gender, place of living, etc. love watching video content. Video content is more engaging and the Instagram platform is one of the best places to grow business. Businesses can directly market to potential clients.